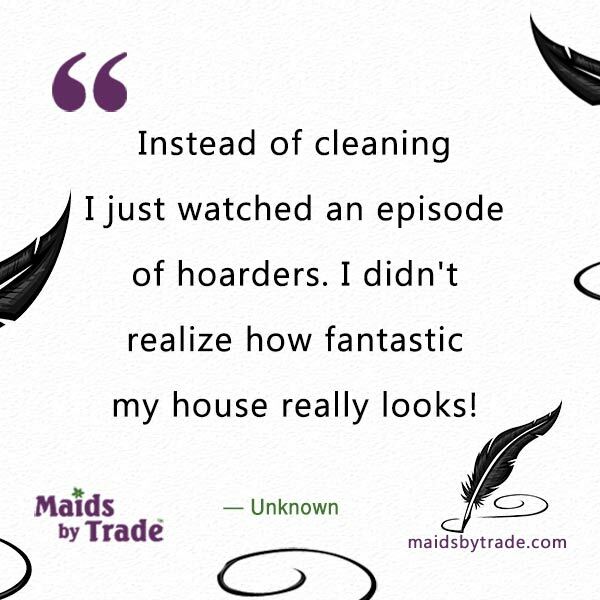 Maids By Trade » Savvy Humor » Are You a Hoarders’ Prospect Yet? Find Out Now! Life is all about perspective, right? Your house is probably sparkling clean compared to the houses they’ve shown on that TV show. Those people literally live in piles of trash. All of a sudden your house is looking pretty immaculate, right? So the next time someone complains about how messy your pad is, turn on the TV, and find the program that shows the messes other people live in. Then they’ll appreciate how clean your house is right now. Just make sure you avoid all of the channels touring celebrity mansions. Chances are the perspective might swing the opposite direction, and no one wants that! It’s your story like Marco & Ana’s from House Cleaning Gone Wild? Hahaha, that’s funny. Actually my volunteer job takes me into a lot of peoples homes and although I am not the greatest housekeeper in the world, I usually feel like that upon leaving many peoples homes.